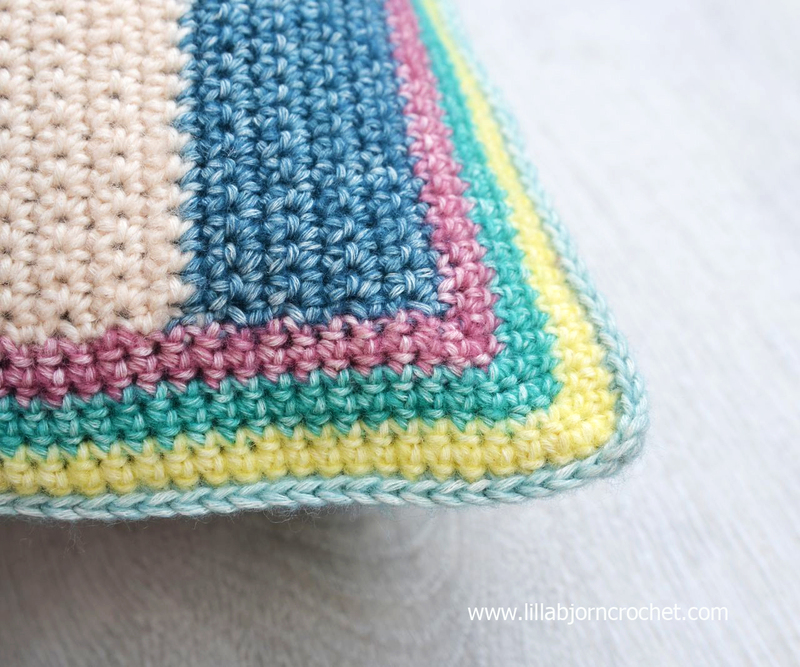 Last week I showed you a photo-tutorial on how to do tapestry crochet. You can check it HERE. I hope it was helpful and if you have never tried tapestry crochet technique, it was easy for you to master it. And today I would like to share my newest pillow pattern.My pillow cover consists of two squares joined together, with zip for easier taking care. Front part is made in tapestry crochet with circles pattern. And back has simple stripes made with single crochet stitches. I wanted this pillow to be reversible. But you can make both sides with tapestry circles if you wish. This blog contains affiliate links. If you purchase a product via a link on my blog, I get a small percentage contribution from the store which enables me to keep providing you with free patterns. It costs you nothing extra to visit the store via my link, but ensure I get the credit for the sale. Thank you for your support! Yarn in 10 shades. I used Stone Washed by Scheepjes in shades 802, 820, 816, 815, 806, 817, 808, 813, 805 and 801. One skein of each shade (but you can create your own color combination if you wish). Please, read my review about this yarn HERE. You can choose and purchase your shades via Scheepjes local shops (NL), Deramores* or Wool Warehouse* (both retailers ship yarn internationally) and Paradise Fibers* (US). The size of finished pillow cover will depend on yarn and hook you choose, and also on your personal gauge. My pillow is approx. 44cm x 44cm (17 ½” x 17 ½”). Gauge for front and back differs a bit, because of additional yarn going through front. Intermediate (though I believe advanced beginners can absolutely try tapestry crochet as well). 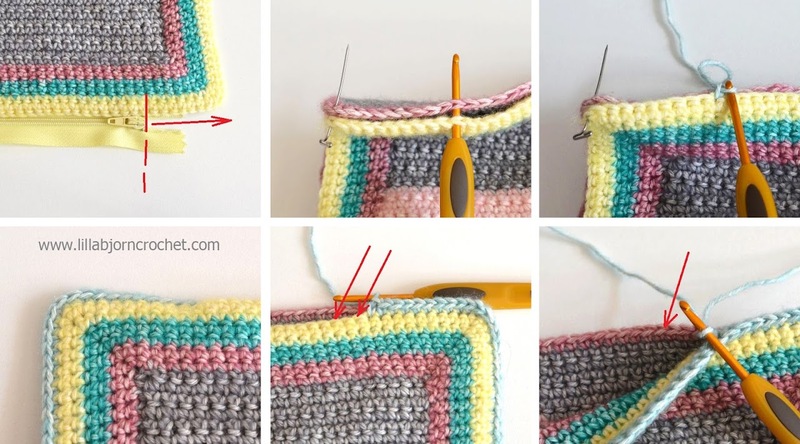 If you have never tried tapestry crochet before, please, study THIS photo-tutorial first and make sure you understand the technique and can read the chart. Change colour on the last yarn-over of the last sc of the relevant row. In the same way as in Windy Morning Shawlette (HERE). Front part of the pillow is made in tapestry crochet. 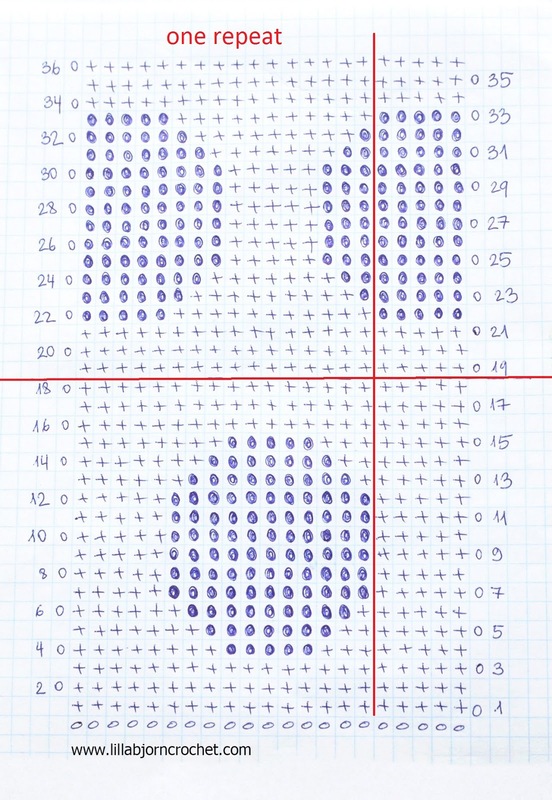 Each repeat consists of 16 sts + 5sts to finish (for symmetry). I made 5 repeats, but you can make more (to make the pillow larger). 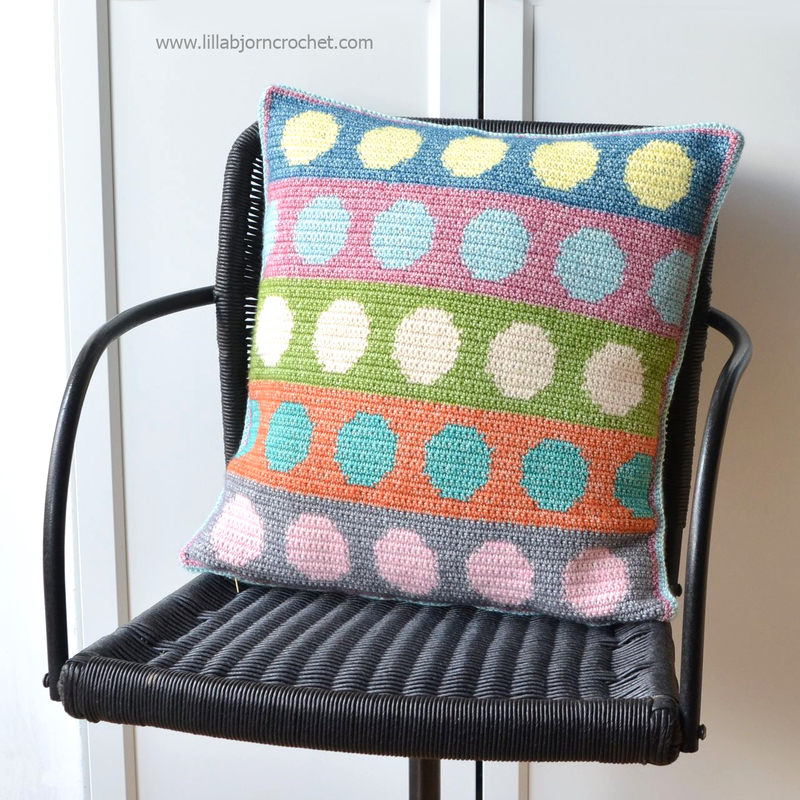 Each stripe with dots (18 rows) is made with yarn in 2 colors. Row 1. Ch86 with 802 (C1). Starting in 2nd ch from hook sc in every ch to the end. (85sc) Turn. Rows 2-3. Ch1 (doesn’t count as sc here and throughout), 85sc. Turn. Row 4. You will start working with shades 802 (C1) and 820 (C2) at the same time. Ch1, *8sc with C1 (change yarn on 8th sc), 5sc with C2 (change yarn on 5th sc), 3sc with C1* 5 times, 5sc with C1. Turn. Row 5. Сh1, *7sc with C1, 5sc with C2, 2sc with C1* 5 times, 5sc with C1. Turn. Row 6. Сh1, *6sc with C1, 9sc with C2, 1sc with C1* 5 times, 5sc with C1. Turn. Row 7-12. Сh1, *5sc with C1, 11sc with C2* 5 times, 5sc with C1. Turn. Row 13. As row 6. Row 14. As row 5. Row 15. As row 4. Cut C2 leaving 15cm (6”) tail. Row 16-18. With C1 as row 2. Change to 816. Cut C1 leaving 15 cm (6”) tail. Next stripe (rows 19-36) will be worked with shades 816 (C3) and 815 (C4). Rows 19-21. With C3. As row 2. Row 22. Ch1, *5sc with C4, 11sc with C3* 5 times, 5sc with C4. Turn. Row 23. Ch1, *6sc with C4, 9sc with C3, 1sc with C4* 5 times, 5sc with C4. Turn. Row 24. Ch1, *7sc with C4, 7sc with C3, 2sc with C4* 5 times, 5sc with C4. Turn. Rows 25-30. Ch1, *8sc with C4, 5sc with C3, 3sc with C4* 5 times, 5sc with C4. Turn. Row 31. As row 24. Row 32. As row 23. Row 33. As row 22. Cut C4 leaving 15cm (6”) tail. Rows 34-36. With C3 as row2. Change to 806. Cut C1 leaving 15 cm (6”) tail. Rows 37-54. Repeat rows 1-18 working with shades 806 (C1) and 801 (C2). Rows 55-72. Repeat rows 19-36 working with shades 808 (C3) and 813 (C4). Rows 73-90. Repeat rows 1-19 working with shades 805 (C1) and 817 (C2). Note: after row 90 you should get a square shape. After row 90 change to shade 808 and crochet around the whole square making 85sc on each side and 3sc in each corner (for even and neat work - make 17sc into every stripe on the sides). Finish with sl st in 1st sc of this rnd or with NJ in 2nd sc. Cut yarn and weave all tails in. You have two options for the back. To make it easier, you can begin with the same stitch count as for front (ch86 and 85sc on each row) and make necessary amount of stripes to match the front in height. Since you will have the same stitch count on the bottom and top, it will be easy to join both parts together. Row 2-90. Ch1 (doesn’t count as sc here and throughout), 75sc. Turn. After row 90 the back is approx. 40cm x 39 cm (16” x 15 ½”). To bring stitch count of the back to the same amount as front, change yarn to 808 after row 90 and start working around the whole square. Rnd 1. 75sc on the top, 3sc in the corner, turn quarter and work 75sc on next side (you will make 7sc and 8sc in every other stripe), 3sc in next corner, 75 sc on the bottom, 3sc in corner, 75sc on next side (same as previous), 3sc in corner. Join with sl st in 1st sc of the rnd. Mark central sc in every corner. After rnd 6 back part should be the same size as front! Place front and back with wrong sides facing (I liked the wrong side look of the border on the back, so I decided that wrong side will be right. But you may join the pillow as you like). You will crochet joning row on the back! With shade 813 start joining both parts on the bottom approx 5cm (2”) before the corner – for an appropriate size of the zip opening. Crochet with sc till the 1st corner (insert the hook under all 4 loops), continue crocheting along 3 next sides, and make the same amount on another edge of the bottom as in the beginning. Don’t fasten off and continue to crochet with sc on the back only. When you come to the beginning of joining row, cut yarn leaving approx 50cm (20”) tail and NJ in 1st sc of joining row. Now crochet with sc along unworked part of the zip opening (on the wrong side of the Front part). When you come to the beginning of joining row, again - cut yarn leaving approx 50cm (20”) tail and finish with NJ to the beginning of joining row. Pin zip to the opening on the bottom of the cover with a few sewing pins and sew it along the opening using yarn tails with running stitch. Secure the tails and cut yarn. Ta-dah!!! 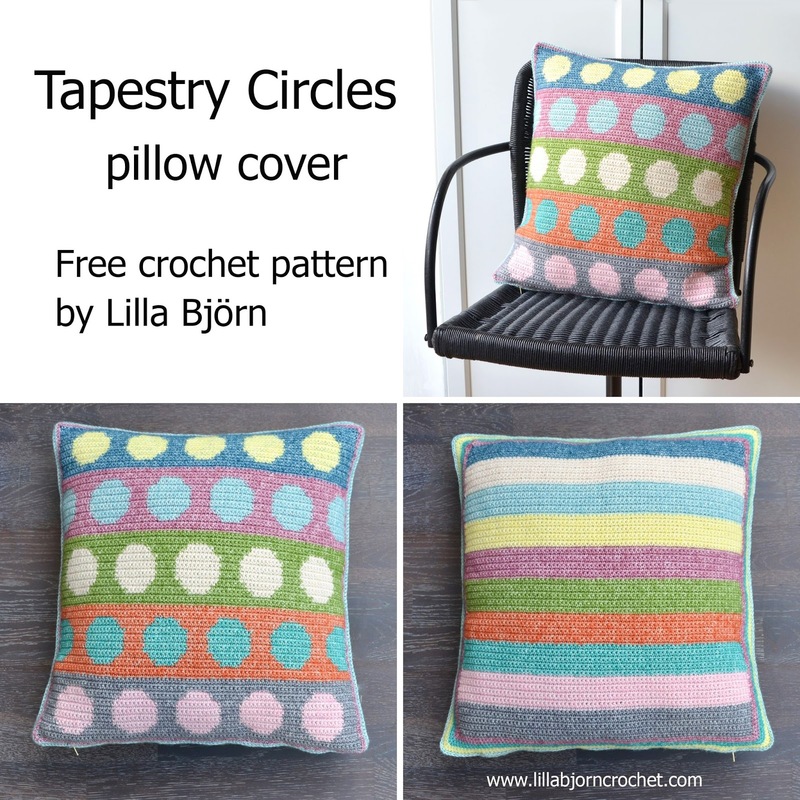 Your very own Tapestry Circles Pillow cover is now finished! Thank you so much for this lovely pattern, and for the wonderfully explicit instructions ... SO much work ~ it's really appreciated :). I have just tried to use the'Print Friendly' button to be able to print it out,but unfortunately it doesn't work. (It also Also, doesn't work for the free Heart pattern (theone that comes with the little bear!). I am using an iPad Mini 4 (all software up to date), and I have used the 'Print Friendly' function button on other sites (and I think here on your site, with another pattern), and it has worked with no problem, which is why I'm leaving you a message here, as I think it may be a site-related error. Hello, thank you for your message. However Print Friendly button is the same on all pages of my blog. And I don't really have control over how it works as it is an external feature. If it worked for other pages, it should work for this one, too. Maybe, try later? It is such a lovely pattern! And made with Stonewashed - my recent addiction ;) I have a question - how does the backside of the circles side look? 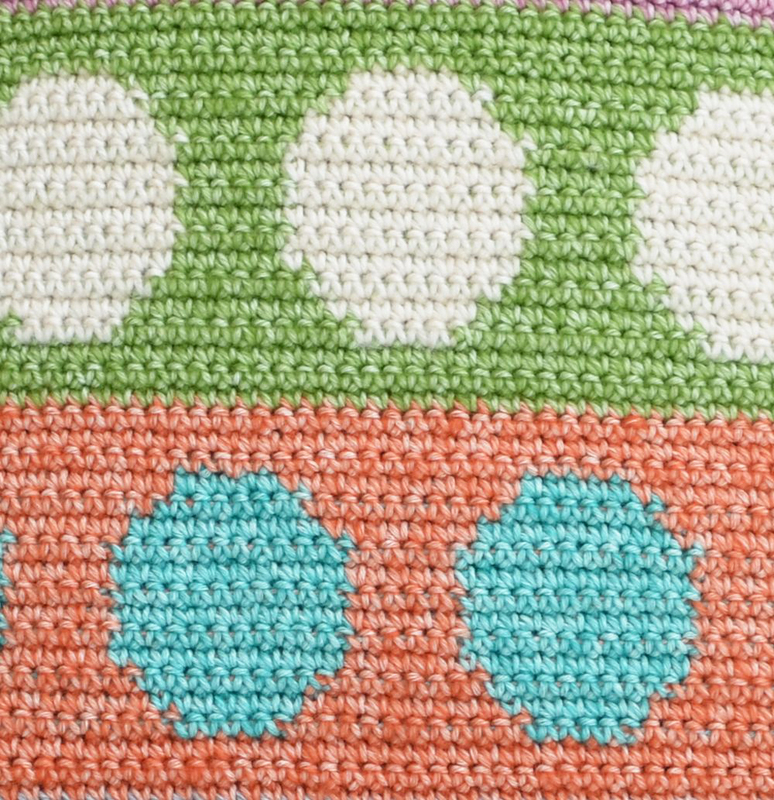 I am thinking of using this pattern for a baby blanket, but never tried this technique and I am not sure how the "left" side would look? 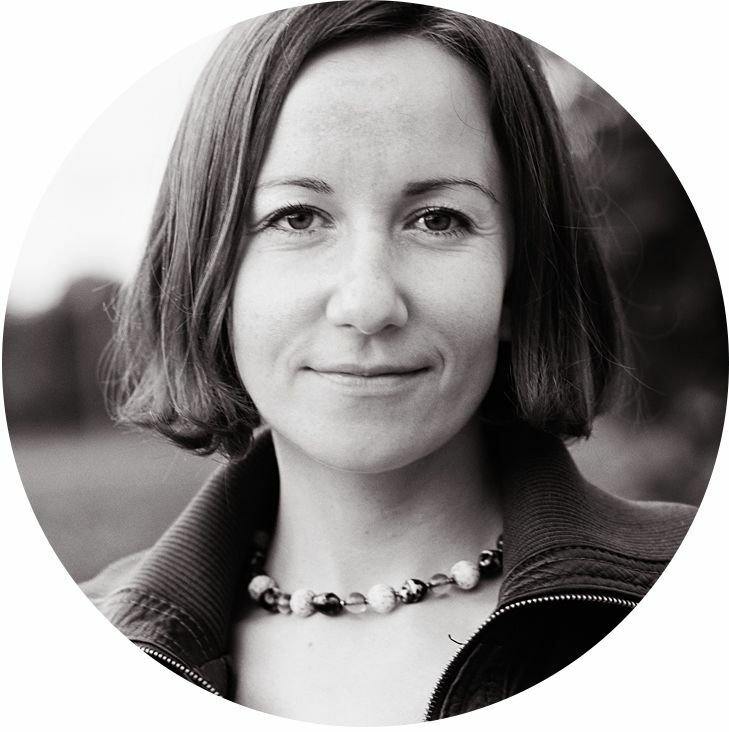 Hi Kasia, tapestry crochet is totally reversable!